Online version pricing information, sample report and to order. Paper version pricing information, sample report and to order. If you and your organization are wondering... "How can we maximize every individual's contribution to our team process?" Successful team members do not do the same thing at the same time. They do the right thing at the right time. A clear understanding of individual roles, in the process of working together toward a common goal, is the first step to creating high performance teams. Creator: Generates original concepts, goes beyond the obvious and sees the big picture. Hands off to the Advancer. Advancer: Recognizes new directions, develops ways to promote ideas and moves toward implementation. Hands off tasks to a Refiner. Refiner: Challenges and analyzes ideas to detect potential problems and may hand plans to Advancer or Creator before handing off tasks to an Executor. Executor: Lays the groundwork for implementation, manages the details and moves the process to completion. There is also a flexer who steps in to fill gaps in the team. The profile uses the "Z Process" to map the flow of assigning roles, completing tasks, then "handing off" to the next person on the team. Using the four roles in the "Z Process" gets new teams moving forward quickly and gets current teams unstuck. 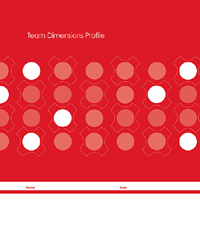 Everything you need to administer the Team Dimensions Profile® is contained in the comprehensive Facilitator's Kit. Designed to provide human resource professionals with practical, research-based expertise, the kit helps you deliver Inscape Publishing's unique Discover & Capitalize approach to workplace learning. Provide a self-directed scoring and interpreting process that actively engages the learner in the context of personal experience. Simplify complex issues to increase understanding. Create a non-judgemental language for identifying and dealing with team process and responsibilities. Value contributions of every team member. Foster self-awareness and behavioral insights for long-term performance results. Ask us about facilitating this program for your organization when you fill out our guest registration. 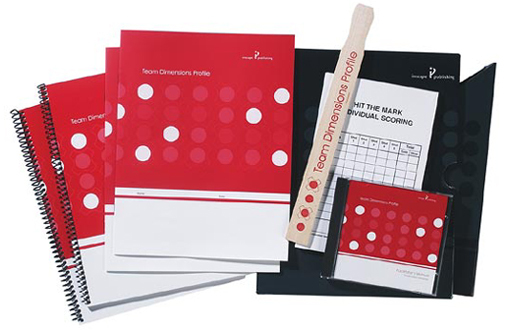 Team Dimensions Profile® is a registered trademark of Inscape Publishing.